Here's the latest in the Christmas present series. 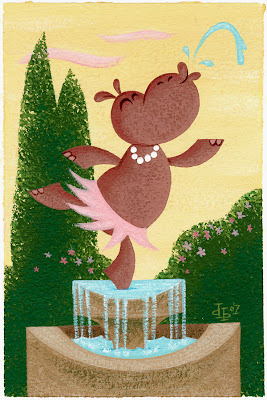 This is for my 9 year old niece who loves hippos and ballet. I've fallen off pace a little because I've been busy, but hopefully I can pick it up on this final week before xmas! At least I plan to have all the kiddies taken care of. Some of the parents might have to wait. BTW, there's a level of sponged-in bushes that my scanner didn't pick up. When I get these paintings professionally shot I'll put the proper color versions up. Another great painting. Love the colors! Love the textures! Thanks a lot Joe! See you on 3ones. Thanks a bunch man. This piece is great. I love the textures you're pullin. Like a background out of the Animaniacs or something. I'm jealous of this one as well.